Let Emergency Dentists USA remove the hassle of finding an emergency dentist for you in Daly City, CA. Emergency Dentists understands that you don’t want to waste time searching for a dentist for your emergency dental needs and that is why we have gathered all the necessary information for you. Call the Emergency Dentists USA hotline to connect with an operator who is able to help you choose the right emergency dentist in Daly City, California. Emergency Dentists USA can find the right dentist for your situation whether you have broken a tooth or have a horrible toothache, an abscess, or a loose bracket. I called Emergency Dentists USA and it took only minutes to find a dentist that could get me in that same day! 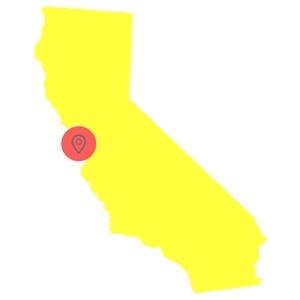 Daly City, California has many different options when it comes to finding a high-quality emergency dentist to handle your dental emergency. Whether you have broken a tooth or have soft tissue injury, there is an emergency dentist available. After Hour Dentists are dentists that have hours later than the standard 5 pm time, making it easier on you to get an appointment if you have to work late or have an emergency later in the day. In Daly City, G Dental Group is open until 6 pm Tuesday through Saturday. The Serramonte Smile Center is open Monday through Friday until 5:30 pm and has appointments during the week available as well as on Saturday. Westlake Dental Care is there all week and even on Saturday until 5 pm. Emergency Dentists USA is an excellent source for quickly finding an emergency dentist in the Daly City area without a hassle. There are a variety of dental clinic options available to help you during your dental emergency. Our listings here on Emergency Dentists USA make it easier for you to find the right dental clinic to treat you when you need it most. Description: If an emergency happens, you can be confident that placing one quick call to our hotline will yield you a competent emergency dental professional within no time! Description: G Dental Group offers office hours on Saturdays from 9 am to 6 pm to help those who are needing a weekend dentist. So, if you have a bad dental issue like an abscessed tooth or a chipped tooth, G Dental Group may very well be the best dentist for you! Description: Westlake Dental Care is a Daly City clinic that can help you and your loved ones with the need for urgent dental care work, procedures such as root canals, and routine check-ups. They are open on Saturdays from 8 AM until 5 PM, and this helps many with busy schedules get in when they most need to. Description: Serramonte Dental group is a vibrant and thriving practice in Daly City that is open on Saturdays from 8 AM until 1 PM, for those whose schedules dictate the need for different hours. You can come in for an extraction, need for a root canal, or any other procedure that is just routine. The staff is always deemed competent, caring, and efficient. Description: Doctor Titus Tang is one of Daly City’s top practitioners that can make sure you are fixed up as far as cavities, x-ray diagnostics, and the need for anything such as root canal therapy. He’s even open on Saturdays from 9AM until 4PM, and has the well-honed skills to make anyone comfortable. Description: Pacific Sky Dental is the kind of place that feels like home, and will take care of you and your family’s dental needs no matter how severe. They are even open on Saturdays from 7AM until 3PM, and on Tuesdays and Fridays they stay open until 7PM. Whether you need something routine such as a check-up or filling, or even an emergency such as a root canal, this clinic will be there for you in full. Bring your most recent dental records and x-rays with you to your Daly City emergency dental clinic. Also, have with you your dental insurance card and identification and check with them to find out if they accept your insurance. Your insurance plan may require you to pay more for a dentist outside of their network. Ask your emergency dentist if they accept your payment method before you arrive for your appointment. Most clinics accept cash and credit cards as payment for their services. Arrive 15 minutes early to your appointment to give yourself time to fill out any paperwork that your emergency dentists might require. Arriving early also gives you the opportunity to ask any questions you might have about your upcoming procedure. Bring a list of all your current medications and supplements. Tell the dentist if you have any allergies to medications. True dental emergencies such as abscesses, cracked teeth, and other soft tissue injuries can be handled at Daly City emergency dental clinics. Below we discuss some of the dental emergencies you may face and some at home remedies to try while waiting to get in to see an emergency dentist. A crown can come loose while eating and can make the tooth it covered extremely sensitive to temperature and pressure. This usually happens due to the tooth under it decaying and losing its shape so that the crown no longer fits. If this should happen, keep the crown in a safe place so that the dentist can reinsert it. A crown is important to keep the teeth from shifting or getting further damaged. If you can not get into the emergency dentist right away, apply a bit of clove oil to the tooth to alleviate pain. Clean the crown and attempt to affix it to the tooth using dental cement purchased from a local pharmacy. 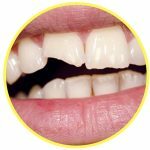 A chipped or broken tooth can be unsightly and painful. The first step is to save any pieces of the tooth that you can find. Rinse the pieces and your mouth with warm water. Save the pieces in order to give them to the dentist. If there is any bleeding, place a piece of gauze on the area and apply pressure for about 10 minutes or until the bleeding stops. A cold compress to the outside of the affected area can help with pain and swelling. If you’ve lost a tooth, retrieve the tooth while holding it by the crown and rinse off the root if it is dirty. Do not remove any attached tissue or scrub it, simply rinse gently. Attempt to place the tooth back in its socket, but do not force it. Be certain that it is facing the correct way. If you are unable to place the tooth back in its socket, put it in a small container of milk. If milk is not available a bit of salt placed in a glass of water will work or go find a product such as Save-a-Tooth and store it in that. It is important to get to the Daly City emergency dentist as soon as possible since a tooth returned to its socket within 1 hour of being knocked out has the greatest chance of being saved. An emergency tooth extraction can be unavoidable on occasion and can seem like a scary experience. 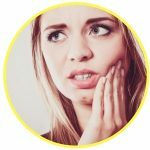 There are a few different reasons that you might have to have an emergency tooth extraction, including tooth decay left untreated or a tooth that is damaged so badly it can not be repaired. It is best to not wait to have the tooth extracted as it can lead to serious health issues like infections of the gums or even to the surrounding bones. 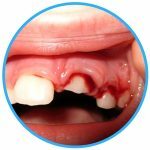 Extracting the tooth can prevent these serious complications. Generally, your Daly City emergency dentist will perform an examination to determine the best way to extract the tooth. A series of x-rays may be necessary. The dentist will then either use a local anesthetic that simply numbs the affected area or use a general anesthetic that allows you to sleep throughout the entire extraction. The dentist then removes the entire tooth whole or in pieces, depending on the condition. They will then place a piece of gauze into the socket to control any bleeding that occurs. Dissolving stitches might also be used. Keep the pressure on the gauze for 30 minutes after the procedure to help a blood clot form to aid in healing. Do not eat while the pack is in place. If the bleeding continues heavily after that 30 minutes, contact the dentist. Do not drink through a straw, spit, smoke, or do any strenuous activity for at least 24 hours after the extraction. Enjoy a diet of soft food for the first day and go back to normal eating as soon as you can chew comfortably. Take any medication that you were prescribed as directed and call the dentist if you should have any nausea, vomiting, fever, or extreme pain or swelling. If your dental emergency is caused by an injury or accident, you’ll want to visit an ER first to make sure there are no other injuries other than to your teeth. The emergency room physician can take x-rays and provide treatment of the injuries. However, the emergency room doctor is not a dentist and they will refer you to a Daly City emergency dentist following your examination if you visit the ER with dental pain only. They can give you necessary medication to help with your dental emergency but will then refer you on to a local dentist for follow up care.